For the optimist, mistakes are an opportunity to learn. Yet for many aspiring bankers, mistakes are a reason not to be hired or promoted. The fact remains, however, that mistakes happen. They are unavoidable even with the greatest amount of diligence and common to every business. The only thing which makes a difference is the way they are dealt with. In an ideal world, companies would welcome mistakes as opportunities to enhance the skills of their managers and employees. Unsurprisingly this is not the case and especially not so in the world of finance. Commercial banking is characterized by an atmosphere of fierce competition for positions and promotions. Highlighting a mistake or error of judgment might deem bankers downright foolish. Should someone nevertheless mention their mistake they will encounter contempt or at least cause embarrassed silence. Generally, we rarely stop to consider that our mistake may not have been a result of carelessness or a lack of ability, but rather of distraction or being overburdened. It is this very fear of errors that has contributed to some of the most high-profile episodes of financial failure in recent years. Research we conducted at ESMT has actually pointed to a worrying level of fear associated with errors. We surveyed 360 managers who had an average age of 43 and were in charge of an average of 150 employees. Our results showed that 88 percent of these managers prefer to talk about errors behind closed doors. Just 11 per cent discuss them openly. When pointing a mistake out to someone higher up the ranks, 86 per cent would do so in private and only 4 per cent would be prepared to broach the issue openly. There are 28 per cent of managers who hope that their errors go unnoticed. The survey also produced some notable differences between age groups. As expected, the older the manager, the more willing they are to mention mistakes, even bottom-up. Unsurprisingly, younger managers were more cautious and expressed a preference to either ignore mistakes or keep them in private. Nearly 20 per cent said they would prefer to correct their errors discretely by themselves – a view shared by only 6 percent of those over 60. All of this points to management cultures, in which mistakes are purposefully ignored. The effects can be severe since managers may perceive a lack of corrective action as a signal that they are becoming more proficient in their work. But if we look closer this lack of criticism is more often due to a lack of open discussion in their organization rather than an improvement in their overall ability. The finance industry seems unwilling to take note of their past, though. Just last year we were made aware of the UBS trader Kweku Adoboli who caused the bank a loss of US$2 billion. JP Morgan also suffered staggering losses of more than US$5 billion due to serious risks taken in trading credit default swaps. In all of these cases the traders involved were making initial profits; but when warning signals should have been raised, no-one spoke out. So how can we prevent these situations and incorporate a culture of error management rather than fear to banking? Lessons can be learnt from the aviation industry. Both airlines and air forces have an active error management called Crew Resource Management or CRM. It encourages pilots to openly accept their errors and analyze and discuss them with their colleagues. Anyone who has witnessed a member of a cockpit crew alerting a colleague to an error was probably amazed to see how calmly the situation is handled. Mentioning errors means dealing with them, treating them as advice and mutual learning rather than criticism. These are the key lessons the management of commercial banks has to adopt. The media have been keen to denounce the actions of those involved in the financial crisis and the public have been taught that this was due to a culture of corporate greed. Maybe so, but the fact remains that banks are in dire need of a system of management, in which an open discussion of errors and their consequences come as naturally as they do in the airline industry. Professor Jan Hagen is Director of Open Enrolment Programs at ESMT (European School of Management & Technology) in Berlin. He teaches the ESMT open enrolment program Crisis Management as well as in customized executive education programs. In addition to his academic work, he has more than 15 years of management experience in the European financial service industry. 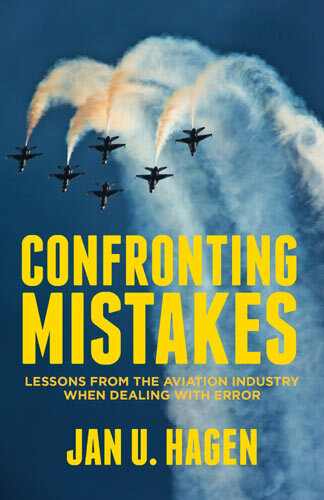 His forthcoming book “Confronting Mistakes: Lessons from the Aviation Industry when Dealing with Error” will be released this Summer.